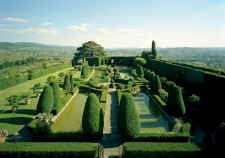 Villa Gamberaia is one of the most celebrated Renaissance villas in Tuscany and one of the few still in private hands. Long famous for its garden visits, the villa now offers vacation accommodation both in the main villa and in apartments within the grounds. All guests have access to an excellent swimming pool as well as the freedom to wander through the wonderful Tuscan gardens. Villa Gamberaia is located in the beautiful hills of Settignano within easy reach of central Florence by car or bus. You can rent the entire main villa. The rooms have en suite bathrooms and are furnished luxuriously. More about staying in Villa Gamberaia. The vacation apartments are located in buildings within the grounds of the villa. They are very comfortably furnished and have fully-equipped kitchens. More about the vacation apartments at Villa Gamberaia. The villa and grounds at Gamberaia provide a wonderful venue for a wide range of events. 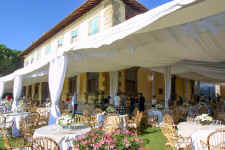 Successful fashion shows as well as wedding have been held at Gamberaia, both outdoors and indoors. More about locating your event at Villa Gamberaia. Villa Gamberaia offers a professional wedding planner who will organise every detail of your wedding celebration at Villa Gamberaia, and in addition, for do-it-yourselfers, the villa offers a wedding planning course. More about weddings at Villa Gamberaia. The gardens of Villa Gamberaia are open to the public upon purchase of a ticket at the villa office. The gardens include the giardino all'italiano as well as the lemon garden, grotto and other features. The optimal time for a visit is from April until September when the statues are uncovered and the lemon trees are in the open. 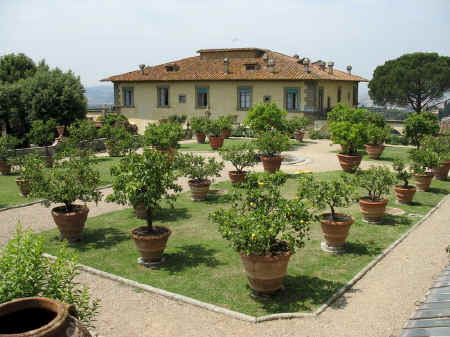 The villa office is happy to organise transport for groups of visitors from Florence to the gardens. More about visiting the gardens of Villa Gamberaia. Villa Gamberaia © ammonet web site promotion 2014 - 2017. All rights reserved.